Area: 1,564,116 sq. km. (604,103 sq. mi. ); slightly larger than Alaska (land boundaries 8,114 km.). Average altitude: 1,580 meters above sea level. Climate: Severe continental, with little precipitation and sharp seasonal fluctuations. Nationality: Noun and adjective — Mongolian(s). Annual population growth rate (2010): 1.46%. Health: Infant mortality rate (under 1 year) — 19.4/1,000 (2008); 20/1,000 (2009); 16.4/1,000 (Oct. 2011). Life expectancy — 67 years (2008); 67.9 years (2009); 68.5 years (women 72.26 years, men 64.93 years) (2010). Ethnic groups (2010): About 94.43% Mongol (predominantly Khalkha); 3.86% Turkic (largest group, Kazakh); Buriat 1.71%. Religions (2010): Buddhist Lamaism 53%, Muslim 3% (primarily in the southwest), shamanist and Christian 5%, other 0.4% and none 38.6%. Education: Years compulsory: 9 (provided free by the government). Literacy (2010) — 97.7%. Branches: Executive: power is divided between a president and prime minister. Legislative — State Great Hural (parliament; 76 elected members). Judicial — Constitutional Court is empowered to supervise the implementation of the constitution, makes judgment on the violation of its provisions, and solves disputes. Legal code based on Continental and Russian law. Legal education at Mongolian State University and private universities. Mongolia accepts International Court of Justice jurisdiction. Political parties: Several registered political parties. 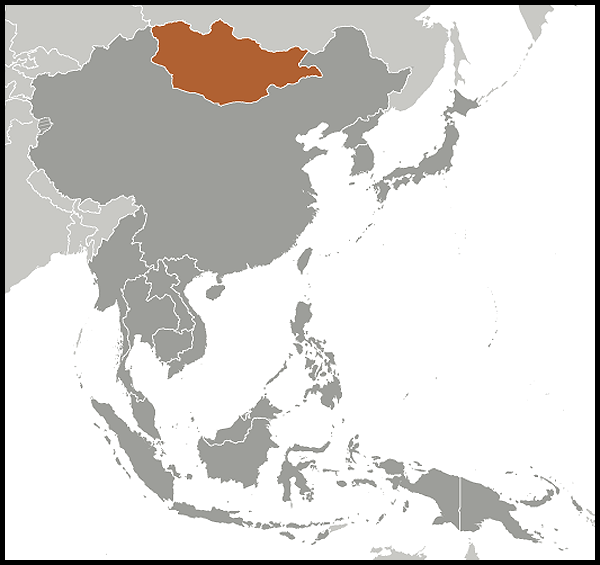 GDP (2010): 8.26 trillion Mongolian Tugruks/MNT (U.S. $6.2 billion at current exchange rates). Per capita GDP (2010): Approx. $2,257. Agriculture (16% of 2010 GDP, livelihood for about 40% of population): Products: livestock and byproducts, hay fodder, vegetables. Industry (31% of 2010 GDP, composed of mining 21.8%, manufacturing 6.5%, and utilities (electricity, gas, and water) 2.4%): Types — minerals (primarily copper and gold), animal-derived products, building materials, food/beverage. Trade: Total turnover of foreign trade for 2010 was $6.1 billion. Exports — $2.9 billion (U.S. dollar (USD) figures based on yearly average USD/MNT exchange rate): minerals, livestock, animal products, and textiles. Markets — Asian countries (approx. 87.4%), European countries (approx. 4.5%), and North American countries (approx. 5.1%). Imports — $3.2 billion: machinery and equipment, fuels, food products, industrial consumer goods, chemicals, building equipment, vehicles, textiles. Suppliers — Asian countries (approx. 46.1%), European countries (approx. 44.1%), and North American countries (approx. 5.7%). Aid received: From 1991-2009, official development assistance to Mongolia from bilateral and multilateral donors totaled over $4.056 billion. Received $357.47 million in official development assistance in 2009. Life in sparsely populated Mongolia has recently become more urbanized. Nearly half of the people live in urban centers, including the capital, Ulaanbaatar. Semi-nomadic life still predominates in the countryside, but settled agricultural communities are becoming more common. Mongolia's birth rate is estimated at 25.1 births per 1,000 people (2009 est.). About 58% of the total population is under age 30, 47.8% of whom are under 14. Ethnic Mongols account for about 94.43% of Mongolia's population and consist of Khalkha and other groups, all distinguished primarily by dialects of the Mongol language. Mongol is an Altaic language — from the Altaic Mountains of Central Asia, a language family comprising the Turkic, Tungusic, and Mongolic subfamilies — and is related to Turkic (Uzbek, Turkish, and Kazakh), Korean, and, possibly, Japanese. Among ethnic Mongols, the Khalkha comprise about 90% and the remaining 10% include Dorvod, Tuvan, and Buriat Mongols in the north and Dariganga Mongols in the east. Turkic speakers (Kazakhs, Turvins, and Khotans) constitute about 4% of Mongolia's population, and the rest are Tungusic-speakers. Most Russians left the country following the withdrawal of economic aid and collapse of the Soviet Union in 1991. Traditionally, Buddhist Lamaism was the predominant religion. However, it was suppressed under the communist regime until 1990, with only one showcase monastery allowed to remain. Since 1990, as liberalization began, Buddhism has enjoyed a resurgence. About 4 million ethnic Mongols live outside Mongolia; about 3.4 million live in China, mainly in the Inner Mongolia Autonomous Region, and some 500,000 live in Russia, primarily in Buryatia and Kalmykia. The Russian revolution and civil war afforded Chinese warlords an opportunity to re-establish their rule in Outer Mongolia, and Chinese troops were dispatched there in 1919. Following Soviet military victories over White Russian forces in the early 1920s and the occupation of the Mongolian capital Urgoo in July 1921, Moscow again became the major outside influence on Mongolia. The Mongolian People's Republic was proclaimed on November 25, 1924. Between 1925 and 1928, power under the communist regime was consolidated by the Mongolian People's Revolutionary Party (MPRP). The MPRP left gradually undermined rightist elements, seizing control of the party and the government. Several factors characterized the country during this period: The society was basically nomadic and illiterate; there was no industrial proletariat; the aristocracy and the religious establishment shared the country's wealth; there was widespread popular obedience to traditional authorities; the party lacked grassroots support; and the government had little organization or experience. In an effort at swift socioeconomic reform, the leftist government applied extreme measures that attacked the two most dominant institutions in the country — the aristocracy and the religious establishment. Between 1932 and 1945, their excess zeal, intolerance, and inexperience led to anti-communist uprisings. In the late 1930s, purges directed at the religious institution resulted in the desecration of hundreds of Buddhist institutions and imprisonment of more than 10,000 people. During the winter after the fall of the Berlin Wall in 1989, peaceful protests led to the resignation of the politburo in March 1990 and Mongolia's first multiparty elections in July 1990. In the democratic era that has followed the 1990 elections, Mongolia has sought to maintain good relationships with its two immediate neighbors as well as with democratic countries further afield (referred to as "third neighbors"), including the United States. Mongolia has also engaged more actively in international organizations including the UN, International Atomic Energy Agency (IAEA), and Association of Southeast Asian Nations (ASEAN) Regional Forum and is seeking membership in the Organization for Security and Cooperation in Europe (OSCE). Since 2002, the Mongolian Armed Forces have trained and deployed thousands of peacekeepers to support peace operations worldwide, including missions in Iraq, Sierra Leone, Kosovo, South Sudan, Chad, and Afghanistan. July 1944: Vice President Henry A. Wallace became the highest-ranking U.S. Government official to visit Mongolia. July 2, 2000: Election resulted in victory for the former communist Mongolian People's Revolutionary Party (MPRP); first-past-the-post electoral system enabled MPRP, with 52% of the popular vote, to win 95% of the parliamentary seats; formation of new government by Prime Minister N. Enkhbayar. June 27, 2004: Motherland-Democracy Coalition formed in early 2004 to contest the parliamentary election. Election resulted in roughly 50/50 split of parliamentary seats between former communist party and democratic opposition and formation of new government by Prime Minister Ts. Elbegdorj (Democratic Party). November 2005: George W. Bush became the first U.S. president to visit Mongolia. October 2007: MPRP ousted its leader, Prime Minister M. Enkhbold, who resigned as Prime Minister. The new leader of the MPRP, Sanjaagiin Bayar, became Prime Minister and formed a new cabinet. July 1, 2008: Two days after parliamentary elections, and 1 day after the ruling MPRP claimed a landslide victory, a sizeable protest outside the MPRP headquarters turned violent. The MPRP headquarters was burned beyond repair and clashes between civilians and security forces left at least five people dead, 13 missing, hundreds injured and hundreds in police detention. President N. Enkhbayar declared a 4-day state of emergency, imposing a curfew, a ban on public gatherings, and a broadcast-news blackout (apart from the state broadcaster). July and August 2008: Newly elected members of parliament from the opposition Democratic Party refused to take the oath of office, demanding, among other things, that the nine-member General Election Commission resign for alleged electoral irregularities. May 2009: Former Prime Minister and Democratic Party legislator Tsakhiagiin Elbegdorj was elected as President of Mongolia in free and fair elections. October-November 2009: Prime Minister Sanjaagiin Bayar resigned for health reasons, and Foreign Minister Sukhbaatariin Batbold was selected as Prime Minister. Prime Minister Batbold largely retained former Prime Minister Bayar's cabinet, with only a few changes. December 2010: The MPRP changed its name to the Mongolian People's Party (MPP). June 2011: Former President Enkhbayar founded a new party with the name "MPRP" in response to the MPP's decision to drop the word "Revolutionary." August 2011: Vice President Joseph R. Biden visited Ulaanbaatar to commend Mongolia on its democratic tradition and contributions to international peace and security, and to pursue more robust economic ties between the United States and Mongolia. Until 1990, the Mongolian Government was modeled on the Soviet system; only the communist party — the MPRP — officially was permitted to function. After some instability during the first 2 decades of communist rule in Mongolia, there was no significant popular unrest until December 1989. Collectivization of animal husbandry, introduction of agriculture, and the extension of fixed abodes were all carried out without perceptible popular opposition. Mongolia's first multi-party elections for a People's Great Hural were held on July 29, 1990. The MPRP won 85% of the seats. The People's Great Hural first met on September 3 and elected a president (MPRP), vice president (SDP — Social Democrats), prime minister (MPRP), and 50 members to the Baga Hural (small Hural). The vice president also was chairman of the Baga Hural. In November 1991, the People's Great Hural began discussion on a new constitution, which entered into force February 12. In addition to establishing Mongolia as an independent, sovereign republic and guaranteeing a number of rights and freedoms, the new constitution restructured the legislative branch of government, creating a unicameral legislature, the State Great Hural (SGH). The 1992 constitution provided that the president would be elected by popular vote rather than by the legislature as before. In June 1993, incumbent Punsalmaagiyn Ochirbat won the first popular presidential election running as the candidate of the democratic opposition. In May 2009, Tsakhiagiin Elbegdorj defeated Nambaryn Enkhbayar in the first instance in Mongolia of an incumbent losing a presidential election. This was also the first election as president of a Democratic Party candidate. As the supreme government organ, the SGH is empowered to enact and amend laws, determine domestic and foreign policy, ratify international agreements, and declare a state of emergency. The SGH meets semiannually for 3-4 month sessions. SGH members elect a chairman and vice chairman who serve 4-year terms. SGH members have been popularly elected by district to 4-year terms. The SGH sits for the full 4 years until a subsequent parliamentary election and cannot be dissolved. In December 2011 the SGH adopted an election reform law to create 48 directly elected mandates in parliament and determine the remaining 28 seats via party lists. Parliamentary elections are next scheduled for June 24, 2012. The president is the head of state, commander in chief of the armed forces, and head of the National Security Council. He is popularly elected by a national majority for a 4-year term and limited to two terms. The constitution empowers the president to propose a prime minister, call for the government's dissolution in consultation with the SGH chairman, initiate legislation, veto all or parts of legislation (the SGH can override the veto with a two-thirds majority), and issue decrees, which become effective with the prime minister's signature. In the absence, incapacity, or resignation of the president, the SGH chairman exercises presidential power until inauguration of a newly elected president. The president may also declare a state of emergency if the SGH is in recess and cannot be summoned in a timely manner; the SGH may then, upon reconvening, revoke such a declaration of emergency within 7 days of its issuance. The government, headed by the prime minister, has a 4-year term. The prime minister is nominated by the president and confirmed by the SGH. Under constitutional changes made in 2001, the president is required to nominate the prime ministerial candidate proposed by a party or coalition with a majority of members of the SGH. The prime minister chooses a cabinet, subject to SGH approval. Dissolution of the government occurs upon the prime minister's resignation, the simultaneous resignation of half the cabinet, or after an SGH vote for dissolution. Local hurals are elected by the 21 aimags (provinces) and by the nine districts of the capital, Ulaanbaatar. On the next lower administrative level, legislative bodies are elected by the provincial subdivisions ("soums") and by the urban sub-districts ("khoroos") of Ulaanbaatar's nine districts. The 1992 constitution empowered a General Council of Courts (GCC) to select all judges and protect their rights. The Supreme Court is the highest judicial body. Supreme Court justices are nominated by the GCC and confirmed by the president; the SGH must be made aware of the nominations but cannot block them. The Supreme Court is constitutionally empowered to examine all lower court decisions upon appeal and provide official interpretations on all laws except the constitution. Specialized civil and criminal courts exist at all levels and are subject to Supreme Court supervision. Administrative courts exist at the province and city levels only and are also subject to Supreme Court supervision. Local authorities — district and city governors — ensure that these courts abide by presidential decrees and SGH decisions. At the apex of the judicial system is the Constitutional Court, which consists of nine members, including a chairman, appointed for 6-year terms, whose jurisdiction extends solely over the interpretation of the constitution. Mongolia maintains an embassy in the United States at 2833 M Street, NW, Washington, DC, 20007; tel. (202) 333-7117, fax (202) 298-9227, website - (http://www.mongolianembassy.us/english.php). Economic activity in Mongolia has traditionally been based on herding and agriculture, although development of extensive mineral deposits of copper, coal, molybdenum, tin, tungsten, and gold have emerged as a driver of industrial production. Soviet assistance, at its height one-third of GDP, disappeared almost overnight in 1990-91 at the time of the dismantlement of the U.S.S.R., leading to a very deep recession. Economic growth returned due to reform embracing free-market economics and extensive privatization of the formerly state-run economy. Severe winters and summer droughts in 2000-2001 and 2001-2002 resulted in massive livestock die-off and anemic GDP growth of 1.1% in 2000 and 1% in 2001. This was compounded by falling prices for Mongolia's primary-sector exports and widespread opposition to privatization. Growth improved to 4% in 2002, 5% in 2003, 10.6% in 2004, 6.2% in 2005, and 7.5% in 2006. Because of a boom in the mining sector, Mongolia had high growth rates in 2007 and 2008 (9.9% and 8.9%, respectively). Due to the severe 2009-2010 winter, Mongolia lost 9.7 million animals, or 22% of total livestock. This immediately affected meat prices, which increased twofold; GDP dropped 1.6% in 2009. Growth began anew in 2010, with GDP increasing 25.3% over 2009 as Mongolia emerged from the economic crisis. GDP growth in 2011 was expected to reach 16.4%. However, inflation continued to erode GDP gains, with an average rate of 12.6% expected in Mongolia at the end of 2011 and higher rates anticipated in 2012 as the government increases transfer and spending programs prior to the June 2012 parliamentary elections. Besides mining (21.8% of GDP) and agriculture (16% of GDP), dominant industries in the composition of GDP are wholesale and retail trade and service, transportation and storage, and real estate activities. Mongolia's economy continues to be heavily influenced by its neighbors. For example, Mongolia purchases nearly all of its petroleum products from Russia. China is Mongolia's chief export partner and a main source of the "shadow," or "gray," economy. The gray — largely cash — economy is estimated to be at least one-third the size of the official economy, but actual size is difficult to quantify since the money does not pass through the hands of tax authorities or the banking sector. Remittances from Mongolians working abroad, both legally and illegally, constitute a sizeable portion. Money laundering is growing as an accompanying concern. Mongolia, which joined the World Trade Organization in 1997, is the only member of that organization to not be a participant in a regional trade organization. Mongolia seeks to expand its participation and integration into Asian regional economic and trade regimes. Because of Mongolia's remoteness and natural beauty, the tourism sector offers potential for growth. Prior to the onset of the global economic crisis, spiking international commodity prices led to a surge of international interest in investing in Mongolia's minerals sector despite the absence of a policy environment firmly conducive to private investment; the end of the crisis brought a return of the attention of foreign investors. How effectively Mongolia mobilizes private international investment around its comparative advantages (mineral wealth, small population, and proximity to China and its burgeoning markets) will ultimately determine its success in sustaining rapid economic growth. Tax reforms enacted on January 1, 2007 and other mining policies helped government revenues jump 33% in 2007. Meanwhile, major amendments to the minerals law allowed the government to take an equity stake in major new mines. Major development slowed in late 2007 and early 2008 as Mongolia's parliament proved unwilling to move on major deals and declined to reform mining laws that observers said substantially varied from best practices. This frustrated many foreign and domestic investors and others who hoped to see Mongolia's promising mining sector grow rapidly. In 2009, sharp drops in commodity prices and the effects of the global financial crisis began to be felt in Mongolia's economy. The local currency dropped some 40% against the U.S. dollar, and two of the 16 commercial banks were taken into receivership, but a series of quick and effective moves, including a Stand-By Arrangement with the International Monetary Fund (IMF), helped maintain stability and kicked off a broad discussion on fiscal and financial reforms. That program concluded successfully in late 2010, but both the IMF and World Bank later criticized Mongolia for returning to potentially dangerous pro-cyclical policies in 2011, with fiscal spending likely to rise prior to the 2012 elections. In summer 2009 the government negotiated an "Investment Agreement" with Rio Tinto and Ivanhoe Mines to develop the Oyu Tolgoi copper and gold deposit. On August 25, 2009, parliament passed four laws — one repealing the windfall profits tax, one adjusting corporate tax structures to accommodate large-scale projects, and two involving infrastructure — necessary to allow the signing of the deal. The deal was concluded in a gala signing ceremony on October 6, 2009, and the agreement went into full legal force 6 months later, on April 6, 2010. Although certain parliamentarians called for elements of the agreement to be renegotiated in late 2011, the Mongolian Government stood by the original investment agreement. Based on a tradition going back to the era of Chinggis Khan, the government of Mongolia expresses public commitment to restoring and protecting its natural resources. As a result of rapid urbanization and industrial growth policies under the socialist regime — particularly resource extraction — Mongolia's environment has been severely damaged. Protecting what remains has policy priority over reclaiming damaged land, although the government recently created a special restoration fund financed by polluter fees. In 2010 the World Health Organization (WHO) identified Ulaanbaatar as having "the world's worst air pollution," with pollutant levels ranging from 10 to 121 times greater than WHO guidelines. The two primary sources of the pollution are the burning of soft coal (or any waste materials) for heating and cooking in inefficient stoves and coal-fired thermal power plants. Road traffic and process emissions from the brick and construction industries are other major contributors to the problem. In 2011 parliament passed the Law on Air Pollution Reduction in the Capital City, and significant efforts — including energy-efficient building and sustainable energy projects to reduce reliance on aging power plants — are underway to reduce air pollution by 50% in 2012. Climate change has been identified by the Government of Mongolia as the most serious environmental issue facing the country. The annual mean temperature of Mongolia has increased three times more than the global average, and the frequency of extreme high temperatures has increased. The resulting desertification has significant consequences for Mongolia's agriculture industry and the traditional nomadic herding lifestyle. Overgrazing by herders attempting to increase their incomes also is a significant contributor to desertification. Mongolia's water issues revolve around water management. An anticipated doubling of GDP over the next decade will shift the balance between user groups and potentially lead to degradation of both surface and ground water quality and quantity. The economic growth will be driven by large-scale mining projects primarily in the water-scarce south Gobi region; these will require large amounts of water for operations (primarily from underground aquifers) and to meet the needs of a large influx of employees. A plan to expand agricultural crop production combined with poor soil quality will lead to widespread use of fertilizer, which could potentially further degrade water quality. In the wake of the international socialist economic system's collapse and the disintegration of the former Soviet Union, Mongolians began to pursue an independent and nonaligned foreign policy. Mongolia is landlocked between Russia and China and seeks cordial relations with both nations. At the same time, Mongolia has sought to advance its regional and global relations. Ties with Japan and South Korea are particularly strong. Japan has historically been the largest bilateral aid donor to Mongolia, although the ongoing $285 million U.S.-Mongolia Millennium Challenge Compact will put the United States in the top spot until it sunsets in 2013. Mongolia has also made efforts to steadily boost ties with European countries. China is the largest foreign investor in Mongolia. As part of its aim to establish a more balanced nonaligned foreign policy, Mongolia has sought to take a more active role in the United Nations and other international organizations, and has pursued a more active role in Asian and northeast Asian affairs. The country is a member of the ASEAN Regional Forum (ARF) and the Pacific Economic Cooperation Council. Mongolia is currently seeking to join the Asia-Pacific Economic Cooperation forum (APEC). It is an observer in the Shanghai Cooperation Organization (SCO), but has stated it does not intend to seek membership. Mongolia began its 2-year chairmanship of the Community of Democracies in July 2011. The country also serves on the UN Economic and Social Council (ECOSOC). Mongolia, which has diplomatic relations with both North and South Korea, has also sought to play a supporting role in the Six-Party talks. In late 2007, it hosted a closed meeting between two Six-Party members, North Korea and Japan. Mongolia has also offered to help organize and to host a northeast Asian regional security mechanism. The country is a founding member of the Asia-Pacific Democracy Partnership (APDP) and hosted the group's planning meeting in Ulaanbaatar on July 1, 2008. In January 2011, Mongolia hosted parliamentary delegates from 19 countries for the Asia Pacific Parliamentary Forum (APPF). Mongolia also hosted a regional workshop of the Comprehensive Nuclear Test Ban Treaty Organization in March 2010 and served as Chair of the Board of Governors of the International Atomic Energy Agency in September 2010. Mongolian relations with China began to improve in the mid-1980s when consular agreements were reached and cross-border trade contacts expanded. In May 1990, a Mongolian head of state visited China for the first time in 28 years. The cornerstone of the Mongolian-Chinese relationship is a 1994 Treaty of Friendship and Cooperation, which codifies mutual respect for the independence and territorial integrity of both sides. China has objected strongly to visits since 1990 of the Dalai Lama; during the 2002 visit, China briefly disrupted railroad links for "technical" reasons, but the November 2011 visit resulted in no specific disruptions. There are regular high-level visits and expanding trade ties. President Hu Jintao visited Mongolia in 2003 (his first international visit as China's President). President Bagabandi visited China in 2004, President Enkhbayar visited in 2008, and Prime Minister Bayar met Premier Wen Jiabao in Beijing in April 2009. Premier Wen visited Ulaanbaatar in June 2010 to open a new cultural center, announce new educational scholarships for Mongolians, and discuss cooperation on infrastructure projects. Mongolian Prime Minister Batbold paid an official visit to China at the invitation of Premier Wen in June 2011. After the disintegration of the former Soviet Union, Mongolia developed relations with the new independent states. Links with Russia and other republics were essential to contribute to stabilization of the Mongolian economy. In 1991, Mongolia and Russia concluded both a Joint Declaration of Cooperation and a bilateral trade agreement. This was followed by a 1993 Treaty of Friendship and Cooperation establishing a new basis of equality in the relationship. Mongolian President Bagabandi visited Moscow in 1999, and Russian President Vladimir Putin visited Mongolia in 2000 in order to sign the 25-point Ulaanbaatar Declaration, reaffirming Mongol-Russian friendship and cooperation on numerous economic and political issues. In December 2003, Mongolia believed it had settled the Soviet-era debt it owed to Russia with a negotiated payment of $250 million. In 2009 the Russian Government stated that hundreds of millions of dollars in debt remained unpaid, but the debt was declared settled in December 2010 when Prime Minister Batbold visited Russia and met with Prime Minister Putin and President Dmitriy Medvedev. During the visit, the leaders announced the establishment of a joint venture in Dornod Province to mine uranium. The Mongolian and Russian Governments continue to jointly own the railroad and the large Erdenet copper mine. Prime Minister Putin visited Ulaanbaatar 2 weeks prior to the Mongolian presidential election in May 2009, and President Medvedev visited Mongolia in August 2009 to commemorate the 70th anniversary of the Battle of Khalkhin Gol (aka Battle of Nomonhan), a combined Soviet-Mongolian victory over Imperial Japan, ultimately leading the Japanese Army to sign a non-aggression pact with the Soviet Union and divert its forces into Southeast Asia. After nearly 2 decades of inactivity, Russia is renewing military ties with the Mongolian armed forces through military education and training exchange programs, as well as joint exercises focused on the repair of Mongolia's Soviet-built equipment. As part of the December 2010 visit, Russia announced it would increase the number of training slots available to Mongolian military officers. In January 2011, Sergey Mironov, Head of the Federation Council (the upper house of the Russian parliament) attended the Asia Pacific Parliamentary Forum hosted by the State Great Hural. President Elbegdorj paid an official visit to Russia and visited several cities including St. Petersburg from May 31 to June 3, 2011. Prime Minister Batbold attended in the Seventh Baikal Economic Forum in September 2011 in Irkutsk, and First Deputy Foreign Minister of the Russian Federation Andrey Denisov visited Mongolia on November 7-9, 2011. 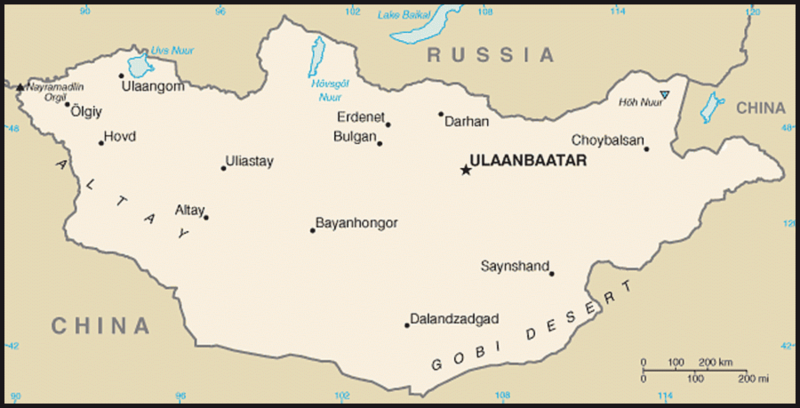 The U.S. Government recognized Mongolia in January 1987 and established its first embassy in Ulaanbaatar in June 1988. It formally opened in September 1988. The first U.S. ambassador to Mongolia, Richard L. Williams, was not a resident there. Joseph E. Lake, the first resident ambassador, arrived in July 1990. Secretary of State James A. Baker, III visited Mongolia in August 1990, and again in July 1991. Mongolia accredited its first ambassador to the United States in March 1989. First Lady Hillary Clinton visited Mongolia in 1995. Secretary of State Madeline Albright visited Mongolia in May 1998, and Prime Minister Enkhbayar visited Washington in November 2001. Deputy Secretary of State Richard L. Armitage visited Mongolia in January 2004, and President Bagabandi came to Washington for a meeting with President George W. Bush in July 2004. President Bush, Mrs. Bush, and Secretary of State Condoleezza Rice visited Mongolia in November 2005. Defense Secretary Donald Rumsfeld visited in October 2005, and Speaker of the House of Representatives Dennis Hastert visited Mongolia in August 2005. Agriculture Secretary Mike Johanns led a presidential delegation in July 2006 in conjunction with Mongolia's celebration of its 800th anniversary. President Enkhbayar visited the White House in October 2007 and the two Presidents signed the Millennium Challenge Compact for Mongolia (see below). House Minority Leader John Boehner visited Mongolia in August 2009. Deputy Secretary of State James Steinberg visited to Mongolia in July 2010. In June 2011, President Elbegdorj met President Barack Obama at the White House. Vice President Biden visited Mongolia in August 2011 to discuss diplomatic and peacekeeping ties with the United States and the need for stronger commercial links. Assistant Commerce Secretary for Trade Promotion and Director General of the U.S. and Foreign Commercial Service Suresh Kumar visited Mongolia in October 2011 to head a U.S. mining and energy delegation and to discuss the bilateral trade relationship. The United States has sought to assist Mongolia's movement toward democracy and market-oriented reform and to expand relations with Mongolia primarily in the cultural and economic fields. In 1989 and 1990, a cultural accord, Peace Corps accord, consular convention, and Overseas Private Investment Corporation (OPIC) agreement were signed. A trade agreement was signed in January 1991 and a bilateral investment treaty in 1994. Mongolia was granted permanent normal trade relations (NTR) status and generalized system of preferences (GSP) eligibility in June 1999. In July 2004, the U.S. signed a Trade and Investment Framework Agreement with Mongolia to promote economic reform and more foreign investment. In July 2007, six members of the U.S. House of Representatives visited Mongolia to inaugurate an exchange program between lawmakers of the two countries. The return visit came in August 2007, with five members of the Mongolian parliament traveling to the U.S. Similar exchanges of lawmakers and staff members have continued. The House Democracy Partnership (HDP), under which members of the U.S. Congress and staff directly assist their parliamentary counterparts in newly democratic countries, is an increasingly prominent means of engagement. In total, 25 Mongolian members of parliament have visited Washington and Macedonia on this program. Several congressional delegations have also traveled to Mongolia, including trips led by Representative David Price in June 2009 and Representative David Dreier in June 2011 as part of HDP's ongoing engagement with the country. Six staffers from the Mongolian parliament also visited Washington during this time. Members of parliament involved have risen in prominence and spearheaded reforms. The U.S. Agency for International Development (USAID) in Mongolia provides targeted bilateral development assistance in two strategic program areas: economic growth and good governance. These activities are conducted with an eye toward assisting Mongolia in managing the expected windfall and the accompanying challenges of its burgeoning mining sector. While Mongolia's rich endowment of mineral resources promises major economic benefits, it also brings even greater opportunities for mismanagement and corruption. In order to maximize its assets, Mongolia needs to manage its mineral wealth, harnessing its transformative properties to lower poverty, raise household incomes, increase political participation (particularly among women and the poor), and steadily improve living standards for all Mongolians. This can be accomplished through improved governance, policy reform, and enhanced private sector and civil society participation. Between 1991 and 2012, USAID grant assistance to Mongolia totaled $222 million. The FY 2011 economic growth program budget of $4,338,000 supports an enhanced role for market-driven, private sector-led economic growth in Mongolia. Business Plus Initiative, a new economic growth flagship mechanism (a $20 million, 5-year contract begun in June 2011) will build upon and consolidate previous economic growth projects, providing the means to influence policy and the institutional framework in ways that increase investment opportunities, improve trade capacity, and stimulate business growth. Good governance programming reflects USAID's continued commitment and comparative advantage in providing assistance to develop Mongolia's democratic government. Sustainable improvements in good governance and rule of law are necessary to strengthen democratic principles of pluralism, equality, and representation in Mongolia's government. Transparency and accountability issues will be targeted through legislative reforms and institutional capacity building; this approach will enhance the capacity of the government to advance national development goals, including sustained economic growth and reductions in poverty through the Strengthening Transparency and Government Effectiveness (STAGE) project, which was under procurement as of late 2011. Governance programming for FY 2011 totals $1,860,000. In addition to regular bilateral and supplemental funding, USAID central funds target a diversity of development needs in Mongolia, including programs that aim to foster an inclusive environment for persons with disabilities, improve responsiveness of local and national government through national consensus building activities, conserve biodiversity, secure livelihoods of the rural poor, increase citizen engagement in the 2012 national elections, and promote economic development through cooperative approaches. USAID is also supporting the Government of Mongolia as the 2011-2013 Chair of the Community of Democracies, an intergovernmental organization focused on strengthening and deepening democratic norms and practices worldwide. In most years since 1993, the United States Department of Agriculture (USDA) has provided food aid to Mongolia under the Food for Progress and 416(b) programs. The monetized proceeds of the food aid ($5 million in 2008) are used to support programs bolstering entrepreneurship, herder livelihood diversification, and better veterinary services. The U.S. Embassy supports a new request from the Government of Mongolia for USDA's Food for Progress assistance. The United States has also supported defense reform and an increased capacity by Mongolia's armed forces to participate in international peacekeeping operations. Beginning in 2003, Mongolia contributed troops to coalition operations in Iraq and Afghanistan, gaining experience that later enabled it to deploy armed peacekeepers to both UN and NATO peacekeeping missions. While early Afghanistan deployments centered on the provision of artillery mobile training teams, current deployments are far more extensive. Mongolia now has some 370 soldiers in Afghanistan in support of both Operation Enduring Freedom (OEF) and the International Security Assistance Force (ISAF), including fixed-site security missions at Camp Eggers and in support of Germany's ISAF contingent in Feyzabad, as well as 25 artillery trainers and six helicopter trainers. At the November 2010 NATO conference in Lisbon, the President of Mongolia stated his intent to double Mongolia's contributions in Afghanistan, which had largely taken place as of December 2011. In addition to deployments in support of coalition operations in Afghanistan and Iraq, Mongolia has deployed over 3,000 of its personnel on UN peacekeeping missions in Chad, Congo, Ethiopia and Eritrea, Georgia, Kosovo, Sierra Leone, Sudan, and Western Sahara. Late 2010 saw Mongolia's first-ever deployment of a UN Level II hospital to Darfur. As of late 2011, Mongolia was at the beginning stages of a 850-troop deployment to South Sudan under UNMISS. In 2005 and 2006 Mongolian Government officials, including President Enkhbayar and Prime Minister Elbegdorj, requested significant increases in the number of Peace Corps volunteers ("PCVs") serving in the country; at the time there were approximately 90 volunteers. Over the past 2 years the Peace Corps program has increased, and as of late 2011, there were 135 volunteers serving in the 21 aimags. At the request of the Mongolian Government, they are engaged primarily in English teaching and teacher training activities. Other program areas include public health, small-business development, and youth development. Mongolia was one of the first countries eligible for the new Millennium Challenge Account initiative that began in 2004, administered by the Millennium Challenge Corporation (MCC). MCC's program focuses on providing grant support to countries that perform above the median in their income peer group on key indicators in three broad policy categories: ruling justly, investing in people, and encouraging economic freedom. MCC-eligible countries propose projects that will significantly reduce poverty in their countries through stimulating economic growth. On October 22, 2007, at a White House signing ceremony, President Bush and President Enkhbayar signed a Millennium Challenge Compact that provided for $285 million of grant funding for the implementation of projects over a 5-year period beginning in September 2008 and ending in September 2013. The Mongolia MCC Compact supports efforts to broaden and deepen economic development in Mongolia for the reduction of poverty and strengthens the role of the United States as one of the largest bilateral donors in Mongolia. MCC-funded projects in country are implemented by MCA Mongolia, a Mongolian counterpart agency that is carrying out activities in five main areas: (1) infrastructure, including construction of the Choir-Sainshand Road; (2) energy and environment, including support for Mongolia's first large-scale wind farm as well as the introduction of new technologies such as more environmentally friendly and energy-efficient stoves in Ulaanbaatar's ger districts; (3) land titling as well as rangeland management in peri-urban areas immediately adjoining Ulaanbaatar and other Mongolian cities; (4) technical education, with a view toward improving both the relevancy and quality of vocational training; and (5) health, with a special emphasis on non-communicable diseases such as diabetes, cancer, and heart disease, as well as initiatives to reduce traffic-related injuries. The U.S. Embassy is located in Micro District 11, Big Ring Road, Ulaanbaatar; tel. (1) 329-095 and 329-606, fax 320-776. Consular and commercial information are available at the embassy's web site: (http://mongolia.usembassy.gov/). Investment Climate Statements are available at (http://www.state.gov/e/eb/ifd/).